VS-R4 riser – Add this four-inch riser to your VSM1 series VariZoom camera slider for additional mounting clearance and extra height. Includes screws for mounting the riser to the slider cart, and the top plate has the same mounting holes and keyway found on the VSM1 cart. The 100mm, 75mm and flat base adapters included with the VSM1 slider attach to the top plate of the riser for universal head mounting. This riser can also be outfitted with optional longer rods, 100mm ball base, Mitchell spud and key for increased versatility and use in other applications. Machined in our factory in Austin, TX. VS-R4 riser – Add this four-inch riser to your VSM1 series VariZoom camera slider for additional mounting clearance and extra height. Includes screws for mounting the riser to the slider cart, and the top plate has the same mounting holes and keyway found on the VSM1 cart. The 100mm, 75mm and flat base adapters included with the VSM1 slider attach to the top plate of the riser for universal head mounting. 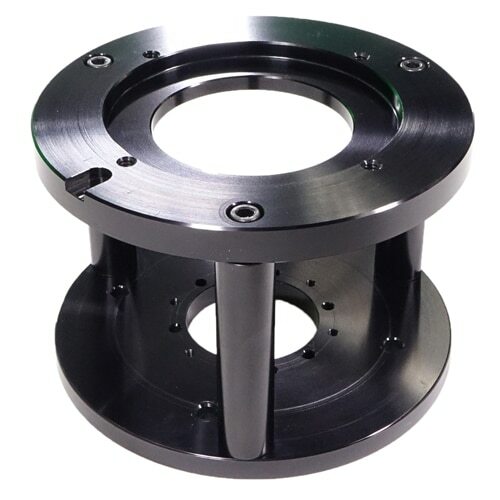 This 75mm and 100mm head riser can also be outfitted with optional longer rods, 100mm ball base, Mitchell spud and key for increased versatility and use in other applications. Mounts to VariZoom VSM1 sliders, can also be outfitted with 100mm ball, Mitchell spud for universal operation.